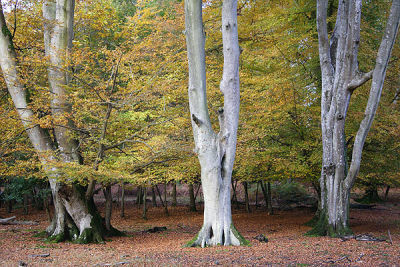 The New Forest is on the south coast of England. It is tucked between Southampton Water and the major port of Southampton in the east, the Solent to the south, the Avon Valley to the west and the Wiltshire chalk downs to the north. The cities of Southampton, Winchester, Salisbury and Bournemouth are all within easy reach, as is the Isle of Wight. At Fawley, in the south-eastern corner of the New Forest, the historic landscape is cheek-by-jowl with a power station and an oil refinery. And within the National Park there is a major theme park and the National Motor Museum. In spite of these modern urban and industrial neighbours the New Forest can feel like medieval England. Stags wander from the mist-shrouded woodland and ponies graze freely under an historic system of common rights.